Zoo educators are responsible for teaching visitors about the animals kept at the zoo and promoting conservation efforts. The primary duty of a zoo educator is to provide information about the zoo facility, its collection of animals, and wildlife conservation. This exchange of information can be conducted formally in lectures and guided tours, or informally by answering questions at exhibits or information booths as patrons take in the sights and sounds of the zoo. Educators may also emcee educational shows put on by keepers and trainers. Zoo educators interact with veterinarians, nutritionists, zoologists, zookeepers, and other zoo staff to keep up to date with the latest happenings at the zoo and its animals. They may also work with the zoo’s marketing and publicity team as they prepare promotional materials featuring the zoo’s programs. Educators may work evenings and weekends as needed, depending on what educational programs are offered by the zoo. For example, some zoos offer special overnight experiences for school groups. Zoo educators may visit schools, summer camps, or scout meetings to present informative lectures to children. They may also be asked to present educational seminars for adults in a business setting or to provide guest lectures at college campuses. Educational presentations may involve bringing and handling live animals such as turtles, parrots, and small mammals. Many zoo educators are responsible for creating educational materials for use in their presentations. These items may include posters, brochures, banners, workbooks, and other handouts. They may also be involved with producing videos, taking photos, and creating multimedia presentations used to promote the zoo and its programs. Materials must be developed and adapted for a variety of age groups, from preschool children to career-minded adults. Zoo educators can find employment with zoos, animal parks, aquariums, marine parks, environmental education centers, conservation centers, and publications. 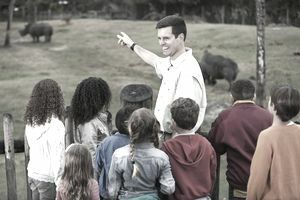 Some zoo educators are also zoologists, zookeepers, or marine mammal trainers and combine their educational duties with these other responsibilities. Zoo educators can advance to a variety of zoo management positions with titles such as Curator of Education, Director of Education, or Zoo Director. Zoo educators tend to have college degrees in education, communications, zoology, biology, animal science, or a related field, though requirements for this position vary from one zoo to another. Advancement to upper-level management positions generally requires additional education (on a Masters or Doctorate level). Since the role frequently interacts with the public, zoo educators should also have extensive training in public speaking and communications. Writing, editing, and photography skills are also a plus, as educators must be able to come up with new materials or update established materials for use in their program. Prior experience working as a teacher is also a big plus. Since they are tasked with creating educational materials for the zoo, it is preferred that zoo educators have advanced computer skills. Working knowledge of programs such as Word, Excel, PowerPoint, and photo or video editing applications will prove beneficial to the educator when they create teaching materials. The International Zoo Educators Association (IZEA) is a professional membership group that seeks to improve the quality of zoo education and assists zoo educators in accessing the most current information in the field. Zoo educators may also join the American Association of Zoo Keepers (AAZK), a membership group that has members from all levels of the zoo hierarchy, from keepers to curators. The salary range for zoo educators is from $27,000 to $55,000 per year according to Indeed.com. In some locations, salaries might be higher such as in New York and California. There is healthy competition for positions in zoos, especially when those positions like zoo educators allow candidates to have hands-on experience animals. Zoo educators can combine excellent communication skills with a genuine love of animals, making this a highly desirable career path.